Special Offer: While Chloë is on site, update skills for your staff and volunteers in exhibit interpretation and customer care with a workshop in public speaking / storytelling. FREE extra this year. Offer ends 31 October 2017. Enhance your visitors’ experience with rich and astonishing live entertainment! What the Puritans didn’t suppress, along with maypoles and Christmas carols, the Victorians bowdlerised. 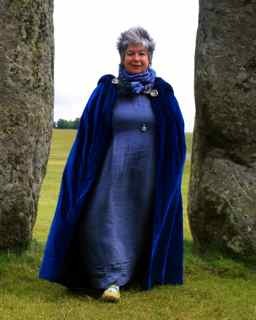 – From husband taming in the Scottish Highlands to wild Welsh spells and deep magic at the heart of England, the ancient tales of our Isles pulse with blood and laughter. Not quite safe, not entirely nice, not always happy ever after. These are stories with guts and energy, that inspired the likes of J R R Tolkien and C S Lewis. Chloë brings the past alive, making fiction vivid with historical fact. Her high energy style delights all ages of visitor – and she can engage overseas visitors with vital story moments spoken in French and/or German. You want authentic? This is a ‘teller who has worn chain mail and wielded a sword; ridden hard through heath and high water; slept under the stars. She’s walked bush, jungle and forest. Knows the smell of rain in many countries. She knows how fast a princess can’t run in a heavy gown – and the relief of back support from tight lacing! She knows castles inside out. Been nearly trampled in the tiltyard, taunted besiegers from the battlements. Wit, warmth and wisdom in traditional tales from cultures around the world: Lakes heave with giant snakes and dragon kings. Vengeful deities unleash flood, fire and quake. Snowfields throng with ice giants and grumpy old women. Eccentric philosphers, doomed sun gods and lovelorn thieves roam the desert. Survival can depend on a horse, a wolf or a single grain of rice. Sculpture Trails & Gardens, AONBs – Story Walks, recorded or live.